This tray must be at least 50 years old. It was my Grandma’s, & she used to line it with grease proof paper and bake shortbread biscuits on it, always with a mixture of butter and Stork margarine. We’d watch 60’s Batman on Saturday mornings as she baked and cooked, the smells filling the small house, Grandad sat in his high-backed chair, even then tipping over the edge into very old age and dementia. I can see this tray now, sitting in its place on top of the cooker in that tiny kitchen. It was a big, old cooker, the type with a ferocious gas flame and a grill on high that needed lighting with a match, risking flashback every time you lit it. 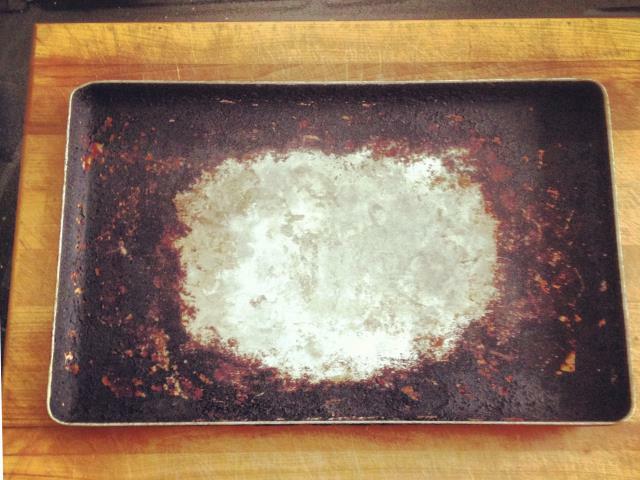 When Grandma died, this tray came my way, and I’ve used it for roasting things, mainly chicken, hence the chicken-shaped clean bit in the middle. It’s nothing much to speak of – just a simple roasting tin of the type that live in kitchens the land over, but this one is mine, and it’s one of those things that are of no value, but priceless, all at the same time. I dare not clean it too much, scrub away the charred build up of meals past and memory, because doing so would wash away the things I remember most about those Saturdays spent watching my Grandma cook. All this from a simple baking tray. I wouldn’t be afraid to clean it — I bet the first thing she’d do is give it a good scraping and a scrub, my grandmother would! So don’t be afraid to!